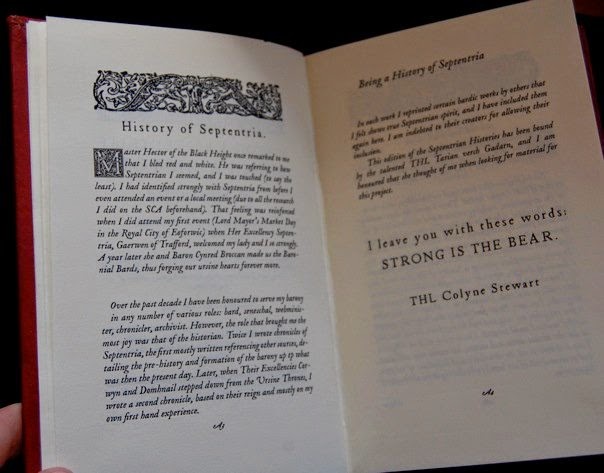 Colyne's History of Septentria, bound by Athrawes Tarian verch Gadarn. As a chronicler and a lover of the past, Colyne has set his pen to documenting and preserving the history of his kingdom, barony and canton. In fact, Colyne has served as the official Historian for the Barony of Septentria since 2002. In 2014 he was also made the official historian for the Kingdom of Ealdormere. A history of the term of Percival and Christiana as Baron and Baroness of Septentria. A history of the Kingdom of Ealdormere, from the time of the first northern settlers to the current age.